Wish You Were Here: Sunrise In Laos Sunrise in Luang Prabang brings out a sea of saffron-cloaked monks and the women who feed them. 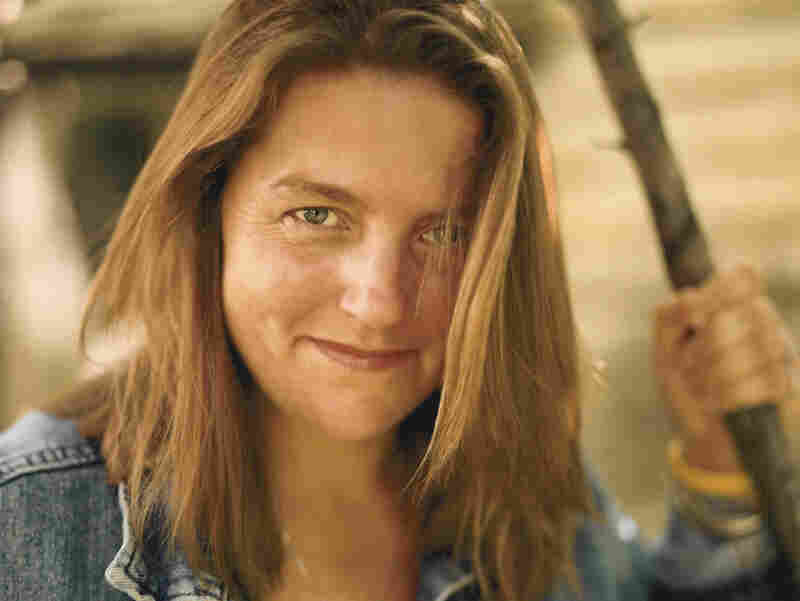 Author Pam Houston, who writes about the American West, says for her it is a must-see place. Journey around the world with the this collection of essays that take you to far-flung fun spots. A sunrise ritual draws Pam Houston to Luang Prabang, Laos. Pam Houston directs the Creative Writing Program at U.C. Davis. Her most recent novel is Contents May Have Shifted. Luang Prabang, Laos, is so close to the equator that daybreak happens at the same time each day. Also each day, a few dozen women set up rice cookers on small collapsible tables on street corners next to the more than 30 monasteries that grace this riverside town. If you get up with them and walk the silent streets in the misty Mekong predawn, you smell, under the sweetness of the frangipani blossoms, the thick odor of cooked starch. I am a mountain girl, and my first love in Asia are the monasteries tucked between the snow-covered razor ridges of the high Himalayas. But I've been drawn south into these humid lowlands by the reported kindness of the Laotian people and the early morning ritual that is about the begin. A rooster crows. A peacock screams. And then the bells of the monasteries begin to have their morning conversation. When the monks come pouring down the stone steps of the prayer halls, they appear first as a river of color, a ribbon of saffron silk, shockingly vibrant against the chalky streets, the dusty footpath, the gray — almost mercuried — sky. All over Asia, monks wear robes the color of spices: curry, cumin, paprika. 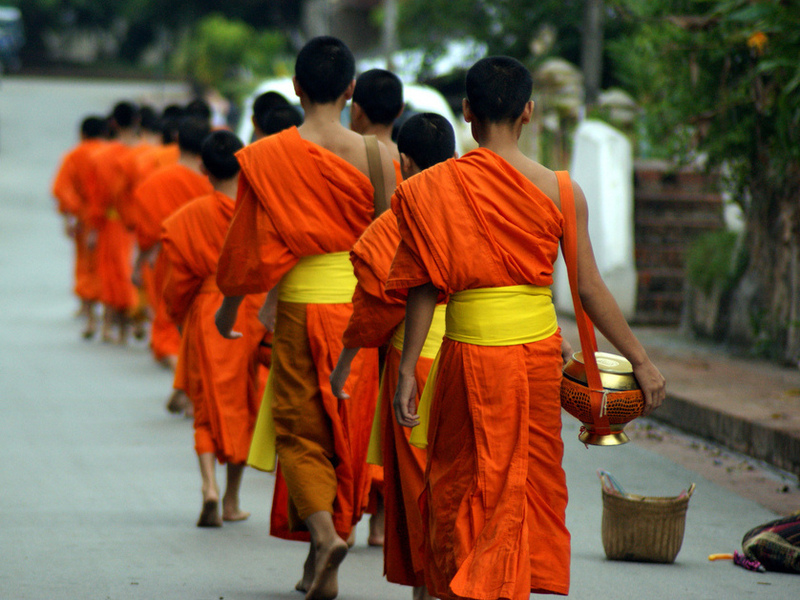 In Luang Prabang, every robe is brightest saffron, the cloth wrapped complicatedly around their torsos and hanging to their ankles, tied at the waist with a bright yellow sash. As they approach it becomes possible to distinguish one monk from another, hands clasped in front of the belly, echoing the shape of the wooden begging bowl they hold. Author Pam Houston thinks you must see dawn in Luang Prabang. Like the Mekong they live beside, this river of men never stops moving; they pass in a quiet, contemplative gait that is two parts walking, one part floating. One by one they drift past the woman, who also keeps a kind of time with her motions: one large scoop of steaming rice into each hand-carved bowl, refill, release, refill again. Every monk bows to her deeply and moves on. Every few streets the same thing is happening: different woman, different monks; same bright, graceful river passing in front of her. And again a few streets over, an unmistakable flash of color, and again, a few streets beyond that. This is what happens here every morning, 365 days, year in, year out. The women up early, cooking in the dark, carrying their little tables in the milky first light. Then the monks, a small fire in the gray light, lightening their rice cookers, lightening their burdens. The sun strengthens slightly. In an hour, the fog will lift and the heat will begin to press down. There is a flick of fire, a swirl of a saffron sleeve as a monk moves around the corner, back up the stairs and into the dormitory, like a magic trick of compassion, of generosity, of prayers offered and received.